websites and applications, services and experiences. 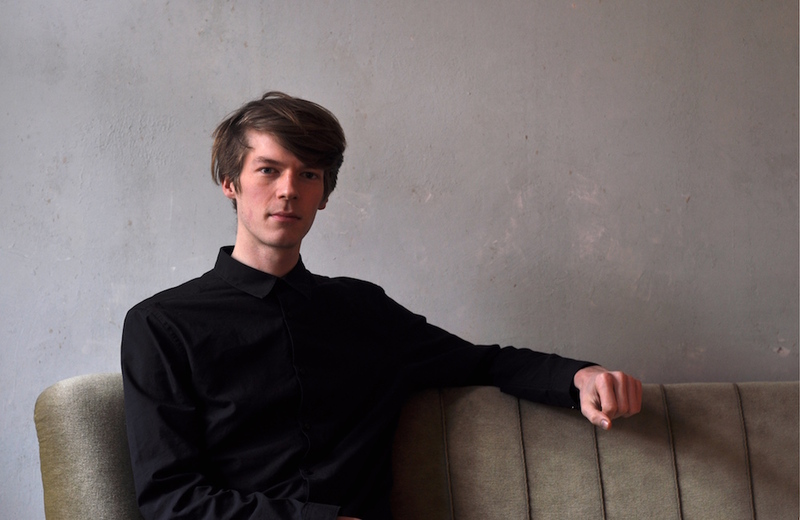 I also enjoy photography and playing the jazz piano. In the psychology lab, different sensing techniques are used as objective measurements for changes in emotional states that are normally invisible to the human eye. What if these same techniques would be applied in the context of everyday social scenarios? Could these novel experiences help augment our understandings of ourselves and others? How might embodied reflections of physiological states and behavioral patterns encourage greater mindfulness, empathy, discovery and interpersonal understanding? Parallel States Experience Labs is a series of interactive experiments that aims to bridge the gap between the lab and the everyday by building meaningful methods of engagement for public audiences, and scalable methods for collecting and analyzing data for researchers. For the Retune festival 2016 in Berlin we created a first setup of the Parallel States Experience Labs and measured patterns of behavioral synchrony and asynchrony during a chat in a bar. After a 10 minutes conversation, participants received the “bill” – their personal value of synchrony. 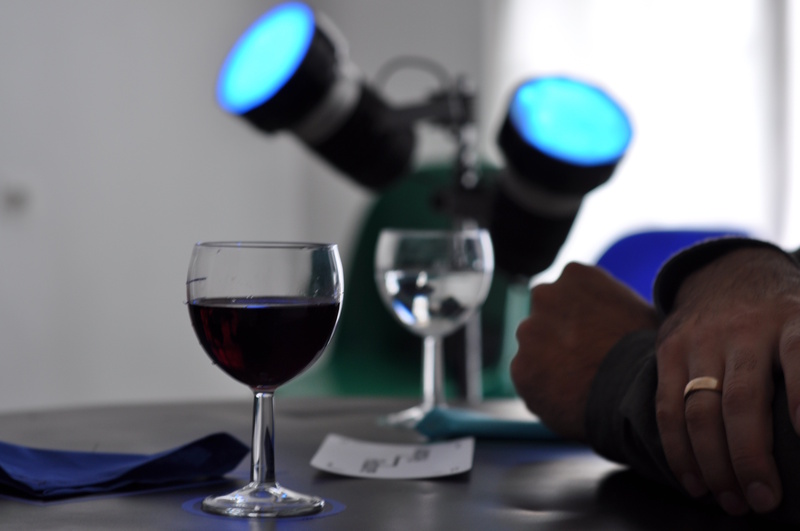 The physical setup consists of a bar table, two stools for the participants of the experiment, a floor lamp and a set of speakers for feedback as well as a bar area for the waiter. The stools are equipped with pressure sensors that deliver an estimation of the body postures users take while sitting at the table. 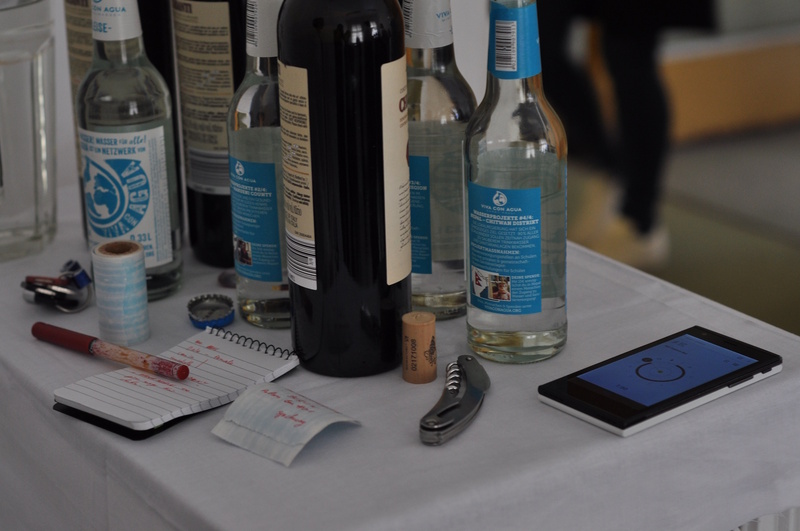 Other sensing data are recorded by a human sensing app that runs on the smartphone of the waiter, e.g. the levels of wine in the glasses, changes to the table settings as well as the conversation flow. The current level of participants’ synchrony is reflected in different properties of the room, such as lighting and ambient sound. All components of the setup communicate wirelessly via OSC. 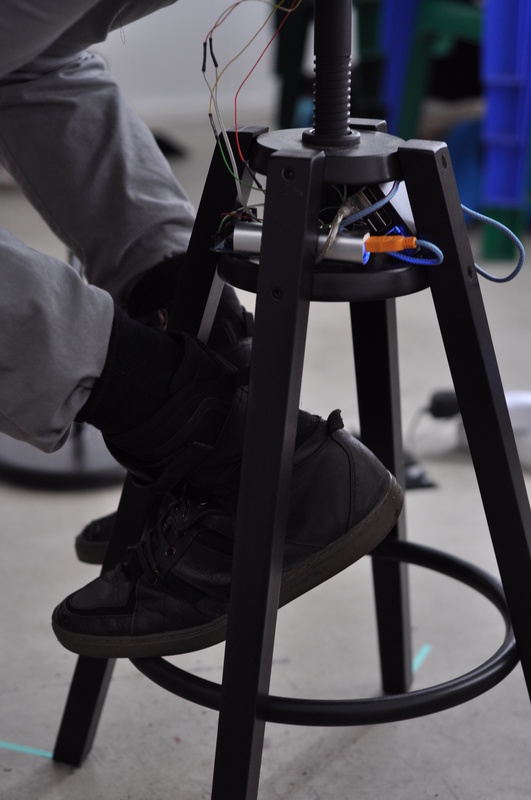 Two Arduinos take the pressure sensor measurements in the stools, Raspberry Pi micro computers are placed inside stools and lamp, the live projection as well as the sound feedback are generated on laptop computers. 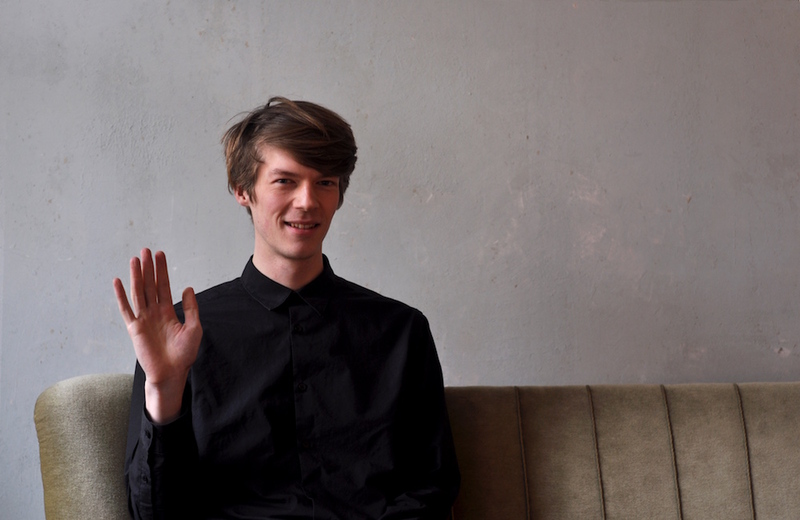 BeAnotherLab Berlin is a newly formed community node of BeAnotherLab which met during Science Hack Day Berlin 2015, where artists, designers, and scientists came together to devise scenarios that speculated on the implications of sharing subjective experiences. 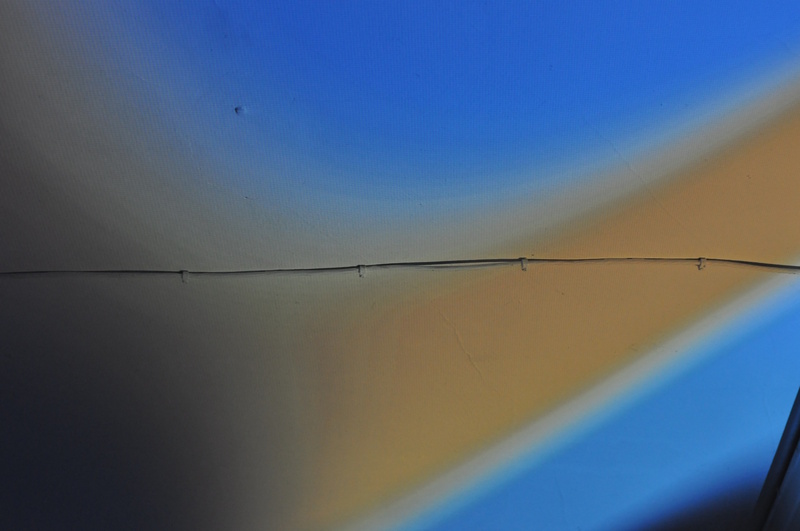 BeAnotherLab Berlin explores meaningful applications for embedded technologies across emerging spatial contexts. In this particular project, my role ranged from co-designing the experience to developing all the components needed for the setup. 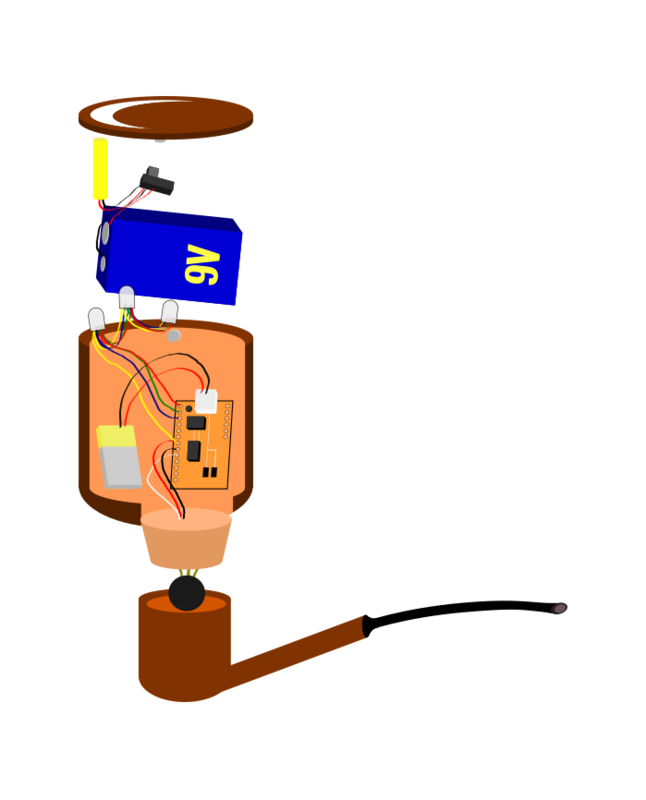 This reached from the human sensing web app over the physical setup of lamp, stools and table to the back-end software required to connect the different modules. For my master’s thesis we designed and prototyped a set of interactive sound and light installations for playgrounds. 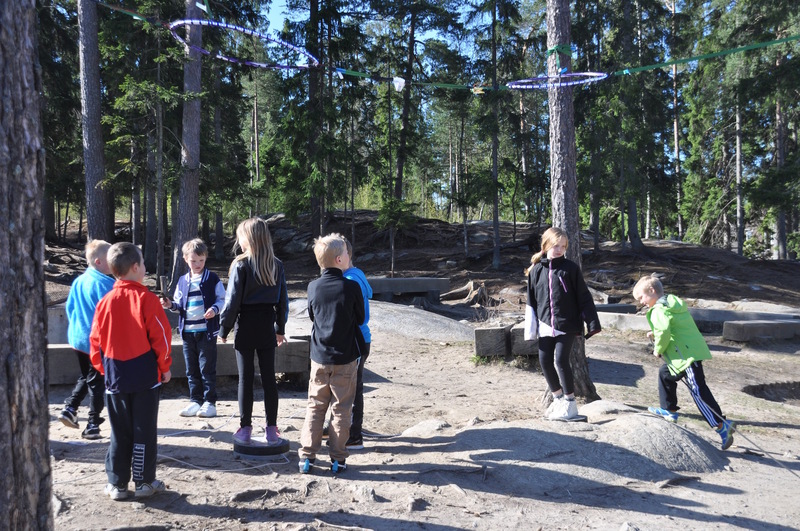 We deployed and tested the installations for one week in a Swedish school yard to examine the consequences of digitally augmented play structures on children’s play. Artifacts from regular playgrounds were digitally augmented to create a more engaging play experience. The installation with rings and large buttons, for example, evoked the fantasy of the children. Our installations were based on two concepts: a tube to cast objects through and a communication system for the playground. Throwing objects through tubes is a common game among children. The interactive tube adds on this by playing back sounds each time an object falls through. Additionally, an overall soundscape increases in intensity with the activity level. Communication is basic to all kinds of games. Like with a walkie-talkie, children can connect to different stations in the playground and talk with their peers there. The three stations we built took different shapes and were placed in different locations of the school yard. Try the concepts in the interactive sketch below. Interactive tube: Click to throw the stones through the tube and it will respond with sounds. With my thesis, I wanted to focus on my interest in interactive architecture. 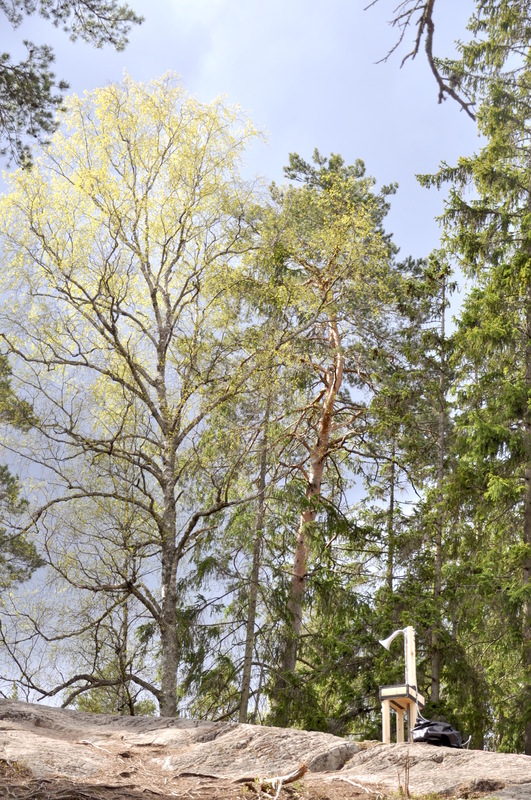 The project brought in two more interesting aspects: landscape and children’s play. The consideration of these three components gave me insights into the relation between space, people and technology. Through the cooperation with partners from industry and academia we had good prerequisites to carry out a project of this dimension. 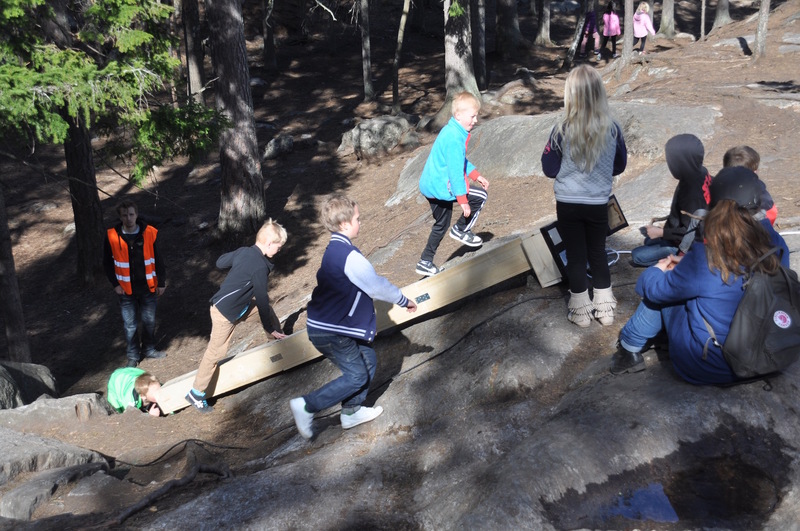 Among the partners were the Swedish playground manufacturer HAGS, landscape architects and a software consultancy. 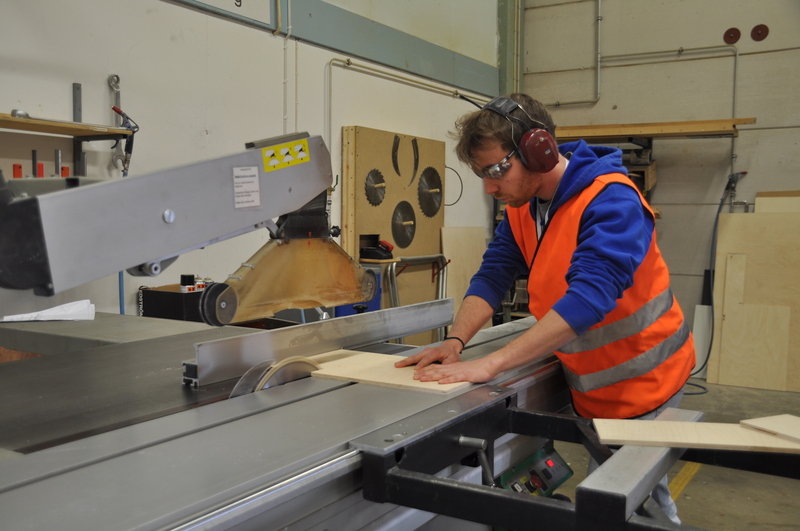 I participated in all phases of the project, ranging from early prototyping over manufacturing the prototypes for evaluation and carrying out the user research necessary for my and my fellow student’s theses. My role was set by the aim of my thesis: to find out about the interplay between technology, environment and play. Therefore, I focused mainly on the design decisions regarding these connections, took main responsibility for the communication concept and did a major share of the project documentation aside the theses. Generally, my focus was more conceptual whereas my colleague worked more on early low-fidelity prototypes. The DigiFys project is further continued by the other project partners from industry and academia. The first results got published in a workshop at ACE 2015 in Iskandar, Malaysia. The Peripipe is an exploration of how interaction design can create emotional bonds between user, artifact and the performed action. 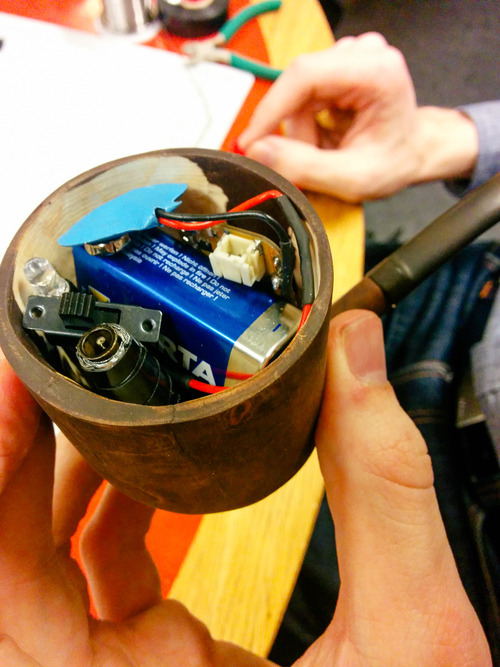 We assigned the functions of a remote control for a music player to a wooden smoking pipe. Users can control playlists on their phones by sips and puffs with the pipe. 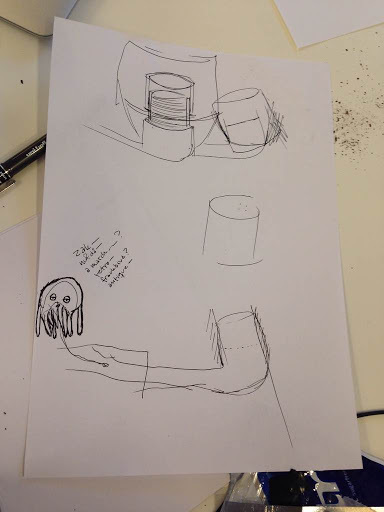 By using the shape of a smoking pipe (a culturally loaded artifact), handcrafting it from cherry wood (beautiful natural material) and controlling the pipe through breath (an interaction modality trained from the first day on) we aimed to create an interface that supports the emotional importance of an act like listening to music better than a conventional remote control, being a rather technical artifact. 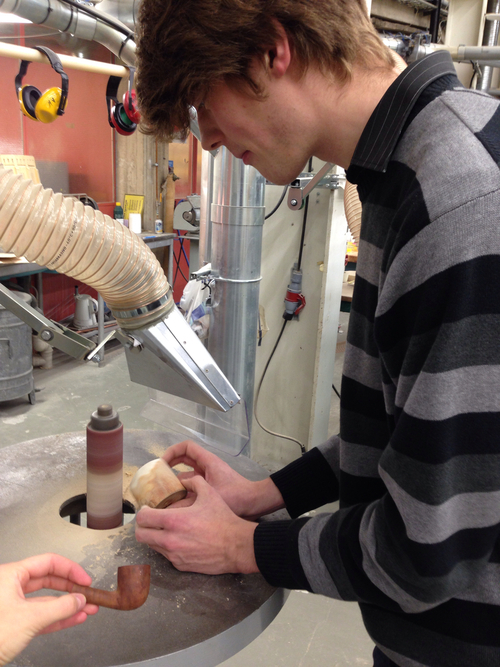 Due to the size of all the components we needed to fit into the pipe, it was necessary to carve our own bowl on top of the original pipe. In the end, everything fit in. The Peripipe was demonstrated, among other places, at the conference on New Interfaces for Musical Expression, NIME 2015, in Baton Rouge, Louisiana, USA. Tangible objects as interactive components for computer systems are getting more and more popular. However, most tangibles make use of the capabilities of our hands. 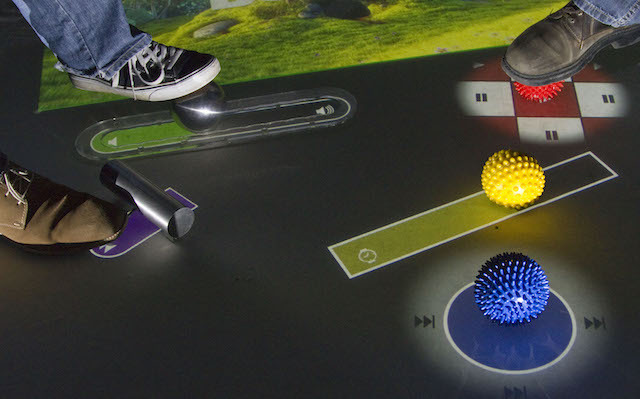 In contrast to that, we created tangible interaction modules that users can operate with their feet, by kicking, rolling or dragging objects on the floor. The meaning that is transported in the physical properties of interactive objects has strong affordances which is especially important for first-time users. Therefore, Kickables suggest to be used in large public installations, such as museum exhibits. Letting the interaction happen on the floor makes it more of a public act than the small-scale interaction with hands. 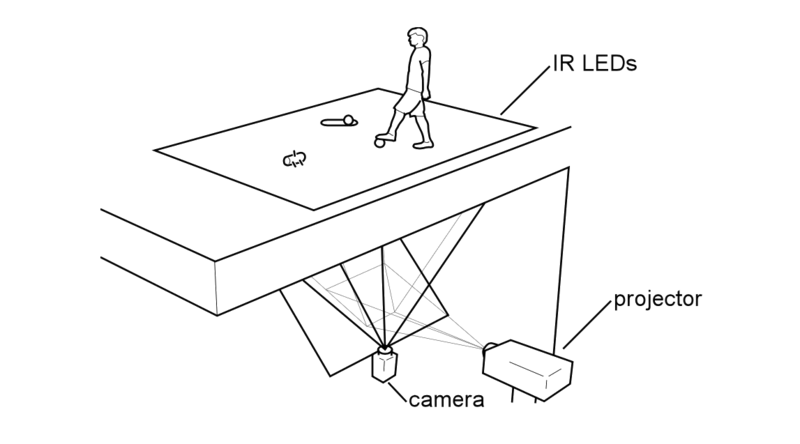 We developed five different sets of controls for foot interaction. Each of them explores a different design principle and has different physical constraints. In this project, I was taking the role of the art director, being responsible for all the graphics, the communication between the student project team and the advisors as well as parts of the front-end programming in QML. Furthermore, I was involved in all interaction design decisions regarding the pressure sensitive floor, writing the paper, designing the poster and shooting the video. I participated less in the back-end programming and the later solution for arbitrary (non pressure-sensitive) floors. The Kickables concept was published as a full paper at CHI 2014 in Toronto, Canada. The research done in this project served as a base for my bachelor’s thesis. The way we move through our cities reflects the pulse of urban life. Constellations seeks to visualize these pulsating, ever-changing patterns in a poetic way. 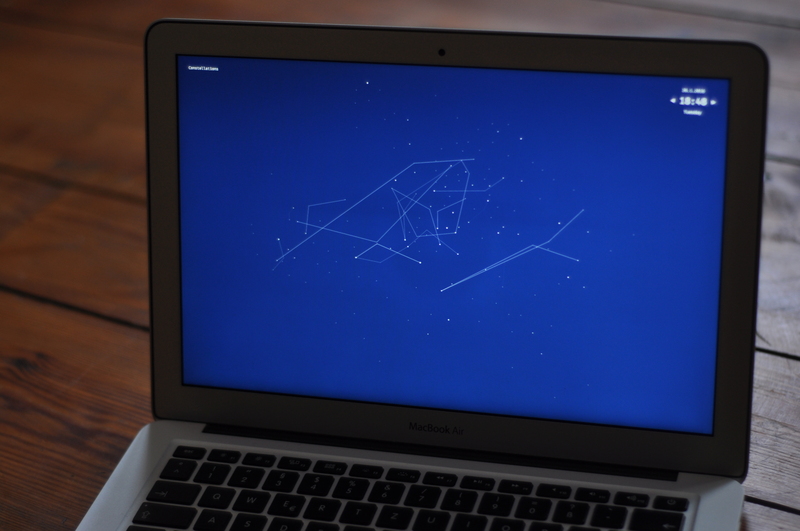 Using public data of the bike sharing service by Deutsche Bahn, we visualize the routes bikers take in the city of Berlin as we usually visualize star constellations. The vision of the concept is to be shown in planetariums along with a sonification that lets visitors re-experience their journeys to the site and discover patterns of mobility within their own cities. Connected spaces promise to revolutionize the way humans interact with their environments. But behind the techno-hype, there is a critical question: how will we design the relationship between people and these connected spaces? In this one-day workshop, we examined design principles for building connected, interactive spaces. Drawing on existing mental models and metaphors, we explored mechanisms of feedback and control, and how they can be brought together to inform inclusive, open-ended and culturally relevant experiences. Using tools and methods developed at ART+COM Explore, participants got the chance to work in interdisciplinary teams and help shape the future of connected spaces. The workshop was hosted by ART+COM Explore and lead by Iohanna Nicenboim, Aurelia Friedland, Raphaël de Courville, and Andreas Rau. DIS 2016 Designing for Children's Outdoor Play. J. Back, C. Heeffer, S. Paget, A. Rau, E.-L. Sallnäs Pysander, A. Waern. 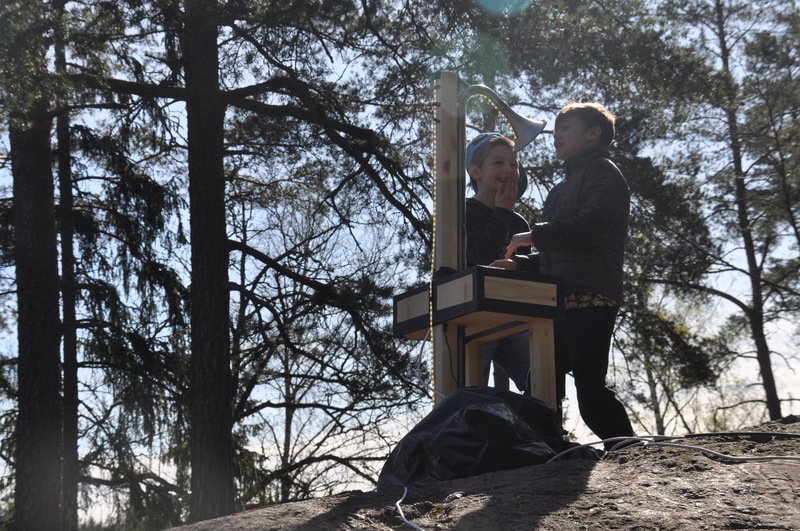 CHI 2016 Designing Children's Digital-Physical Play in Natural Outdoors Settings. ACE 2015 DigiFys: The Interactive Play Landscape. A. Waern, J. Back, E.-L. Sallnäs Pysander, C. J. H. Heeffer, A. Rau, S. Paget, L. Petterson. 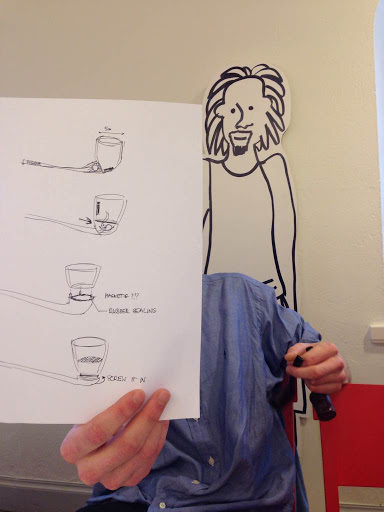 NIME 2015 The Peripipe: A Sip-and-Puff Remote Control for Music Playback. T. Feldt, S. Freilich, S. Mendonsa, D. Molin, A. Rau. SMC 2014 Puff, Puff, Play: The Peripipe Remote Control. CHI 2014 Kickables: Tangibles for Feet. D. Schmidt, R. Ramakers, E. Pedersen, J. Jasper, S. Köhler, A. Pohl, H. Rantzsch, A. Rau, P. Schmidt, C. Sterz, Y. Yurchenko, P. Baudisch. CHI 2013 Gesture Output: Eyes-Free Output Using a Force Feedback Touch Surface. A. Roudaut, A. Rau, C. Sterz, M. Plauth, P. Lopes, P. Baudisch. WHC 2013 Gesture Output: Eyes-Free Output Using a Force Feedback Touch Surface. C. Sterz, A. Rau, A. Roudaut, P. Baudisch. I would be happy to hear from you. You can drop me a line at interaction@andreasrau.eu or call me at +49 157 74646552.